“We have a problem with dangerous molluscs,”my husband announced. I did a double take. It’s not every day your soul mate drops a line like that one. 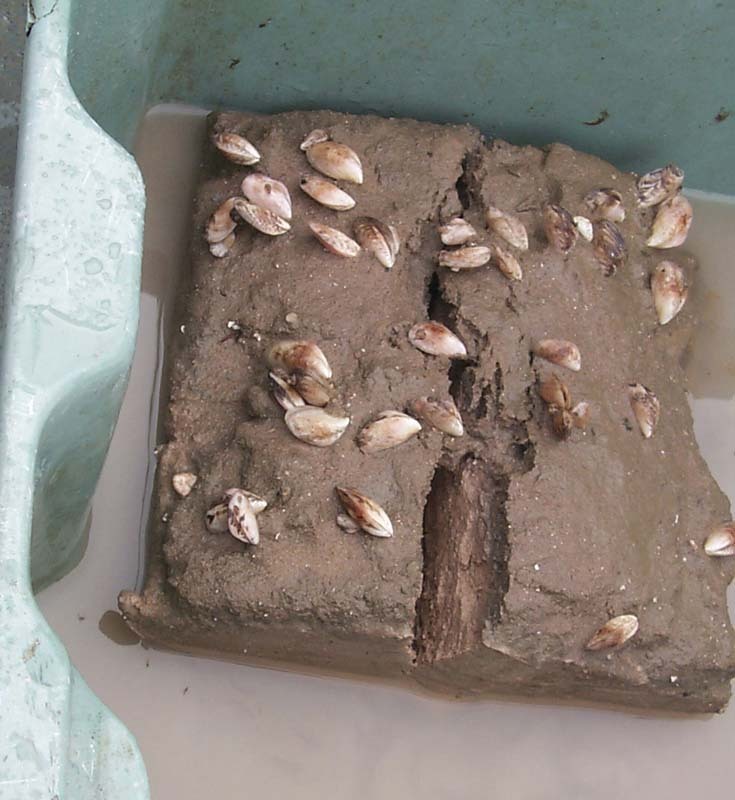 It must be true, it was on the BBC: the tiny shellfish – Quagga Mussels – were found near Heathrow Airport in a reservoir which has sheep safely grazing on its banks. They (the molluscs, not the sheep) are very dangerous. Originally from The Black Sea, they latterly hail from Mother Russia herself, whose ships have been carrying them around with them for a while now. They are socialist Molluscs. Tiny, innocuous and seemly self effacing, they work in well-ordered collectives to eat the pollutants in the water. And with Machiavellian simplicity, with implacable impassivity, those tiny frames conceal machines, dastardly natural mechanisms which turn mere pollutants into poison. These Soviet Molluscs cling to the bottom of boats. Right now, in America’s Great Lakes, American men battle Soviet Molluscs to contain them after it is thought Russian Boats discharged them, along with their ballast, out into those wide expanses of the Water Of The Free. Not only that: these East European enemies infiltrate our water pipes and simply jump one on top of the other, threatening to clog the pipes forever. Insidious. Ingenious. Relentless. Everything that stopped Napoleon and Hitler in their tracks, now in a water pipe somewhere near the runways of Heathrow. Of course the British wildlife police are all over them like a rash. The Wildfowl and Wetland Trust (WWT) have clocked the infiltration. They’re on the case, and they’re shouting it to the rooftops. No cloak of secrecy here, Comrade Shellfish. I assume that behind the scenes they are combing Oxford and Cambridge water pipes for unusually intuitive molluscs, irresistible to lady molluscs, who drive fast mollusc cars and carry stylish mollusc revolvers. All this situation needs is a little British crustacean pluck and charm. Those Rusky molluscs are no match for our chaps. Posted in Uncategorized, WhimsyTagged Britain, ecology, humour, molluscs, wildlifeBookmark the permalink. I read about you invasion in the news today. You definitely put a more dastardly spin with your British sense of humor (which by the way, I have been been accused of having the same). Where is the Kim Philby mollusc? Is George Smiley on the trail? They, alas, are in homes for ex-intelligence molluscs. They’re keeping the new men hush-hush. wow, the UK invaded by the Riussians. and we thought that was not going to happen. It took a mollusc to achieve it, Sidey. A new form of shelling? Wait. They are in the Great Lakes? Mollusc’s in UK and USA. Those little buggers are threatening my water pipes? and I’ve been worried about the deer. Sigh. They are indeed, Penny. There’s a Soviet mollusc somewhere near you. Ah: globetrotting fish. From Japan. Naturally. Lake Michigan is quite a melting pot, isn’t it? The swines! I can see it now, a whole new Cold (water) War. Let’s hope our native molluscs see those reds off their rocks! 😀 Thanks, Sophia! Our molluscs are made of stern stuff. I feel sure they will keep our end up. I think it was the headline – ‘Dangerous Molluscs’. The mind just boggles, doesn’t it? I’d agree here, Madhu. Maybe the MI5, Shellfish division. LOL! Hey, we might get some cold-war guality espionage stories out of this. That genre of literature hasn’t been the same since the wall went down. Well, California is safe! We are too hot and dry and our serious water shortage is surely not a boon to the mollusc population. This all sounds very James Bond to me…are we sure they’re real and not just spy paraphernalia?